"Everybody wants to see the 100m go but the 200m is for me," he said. "If I can get a perfect season where I'm working well, without any injuries, with no time off, I'll definitely have the chance to break the 100m world record. "The 200m is my personal focus. One of my biggest goals is to try to run sub-19, pushing the barrier a little bit will be great for me." Bolt's 2014 campaign was disrupted by foot and hamstring injuries and he only ran in three races - including a leg for Jamaica's victorious 4x100m relay team at the Commonwealth Games - before bringing his season to an early end. 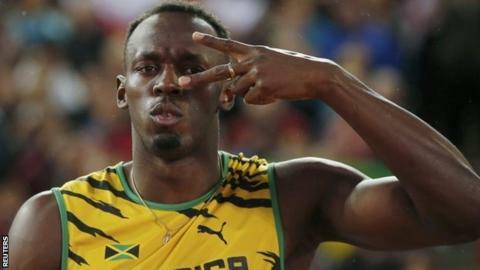 Bolt's quickest 200m time since setting his world record in Berlin was the 19.32 seconds he clocked at London 2012. In an interview with Al-Jazeera, Bolt also offered a partial defence of the six positive doping tests returns by Jamaican athletes - including Asafa Powell and Veronica Campbell Brown - in 2013. "There were mistakes but there weren't any serious drugs," he said. "It is still bad: the drug scandal. But it was a good thing it wasn't like they were deliberately going out of their way to take drugs."